This Romanian dessert has three layers: a sweet crispy coating, a soft inner dough, and a fruity core. A first bite from the dumpling usually samples the first two, only to slightly reveal the latter and to invite another mouthful. It is a great treat during the plum season, and a delightful way to savor this fruit. - Preheat the oven to 425F. Bake the russet potatoes for about an hour (use a toothpick to test when ready). Let them cool a bit, then peel and grind them (I use a potato ricer). - Melt the butter in a pan on medium heat. Add the breadcrumbs, stir in one tablespoon of vanilla essence and cinnamon to your taste, and cook for a few minutes until they turn a nice golden color. Remove from heat, stir in the brown sugar, and mix till uniform. - Cut the plums in half and remove the kernels. Sprinkle sugar and cinnamon on the plum meat, and let sit for a while. I prefer the smaller plums, as you can use both halves together in each dumpling (if the plums are bigger, use only half per dumpling). - Gently mix the baked potatoes with the flour, cream of wheat, and a pinch of salt. Add the whisked eggs and one tablespoon of vanilla essence, and mix till uniform. It is ok if the composition is a bit sticky. - Now to forming the dumplings. Coat your palms with a bit of flour. Grab three-four tablespoons of mixture and gently press it flat to about a third of an inch. Roll the dough uniformly around a plum (or only half of it if the plums are big) - there should be no piece of the plum visible to the outside. Gently sprinkle a bit of flour on the outside, such that they don't stick to one another. Repeat until all dumplings are done. - Bing enough water to a boil in a large pot. Add the dumplings one by one. Boil them until they raise to the top (about 5-10 minutes), plus another 5 minutes. - Remove the dumplings from water, one at a time. You need to handle them very gently, as the exterior is fairly soft and can break easily. Roll the dumplings through the golden breadcrumbs mixture, then set aside. - I prefer to serve them at room temperature, but they're also good warm or cold. - Choose a nice serving plate or bowl whose color matches the beautiful golden texture of the dumplings. 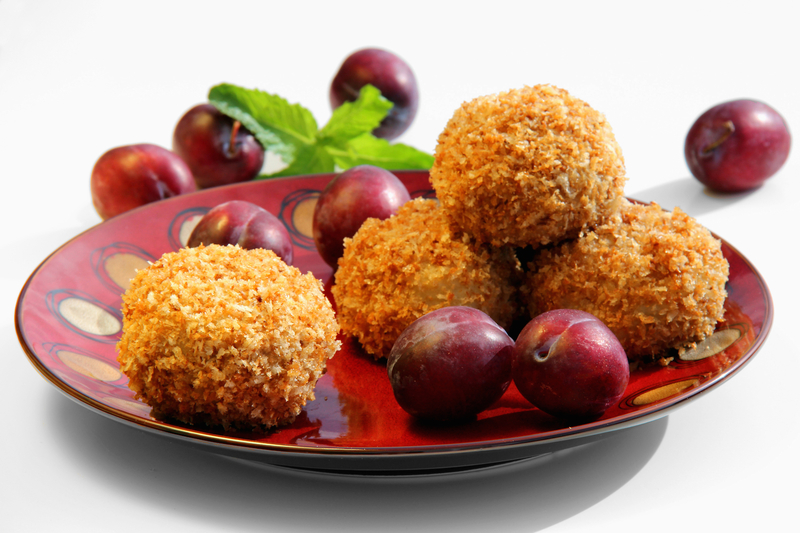 - I present the dumplings alongside a few extra plums - they are at the core of the recipe. Any guest who also tries a plum will get to appreciate the extra vanilla and cinnamon flavors we added to the dish. - A few leaves of mint always bring a glimpse of freshness to the presentation.